1 of 6 Heat oven to 350 degrees F. Butter and flour 9-inch springform pan. 2 of 6 Combine flour, baking powder and salt in medium-size bowl. 3 of 6 Place 3/4 cup sugar and almonds in food processor. Process until finely ground. Add butter to processor. Process to combine. Add eggs and vanilla; process to combine. 4 of 6 Add milk to egg mixture in processor; process until blended. Add flour mixture; process until well blended and smooth. Add orange rind; process to blend. 5 of 6 Spoon batter into prepared pan. 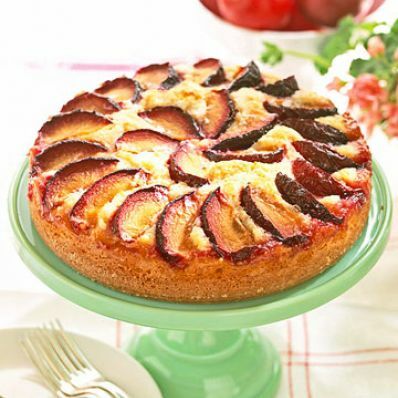 Arrange plum slices decoratively over batter. Sprinkle remaining 1/4 cup sugar over plums. Dot with the remaining 2 tablespoons butter. 6 of 6 Bake in 350 degrees F oven for about 1 hour or until top is lightly browned and wooden pick inserted in center comes out clean. Dust with confectioners sugar, if desired. Cool before serving.